What It’s About: Teens run over an alien that is part of an invading force. Unfortunately, the authorities refuse to believe the teens-can they find a way to stop the aliens on their own? Why Watch it Today? : Today in 1947 Kenneth Arnold saw UFOs that he described as flying like a “saucer skipping across water”. The reporters shortened that description to the familiar “Flying Saucer” so popular in the late 1940s and 1950s. 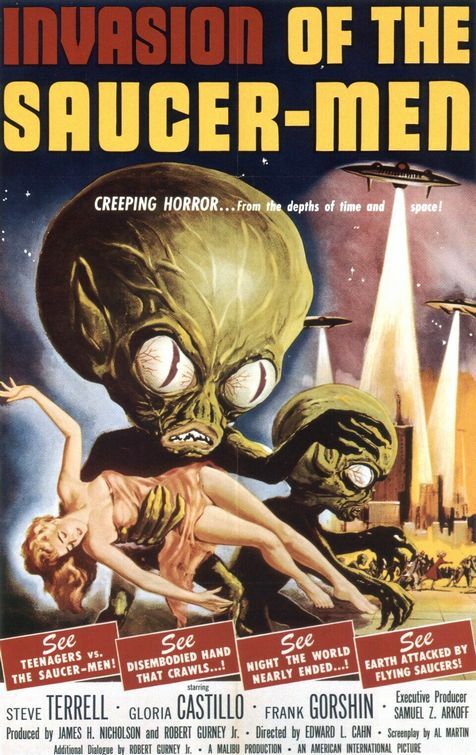 Invasion of the Saucer Men is a pleasantly tongue-in-cheek take on the alien invader sub-genre. This entry was posted in Aliens, Based on a Short Story(ies), Black and White, Comedy, Horror, Independent, Monster, Movie of the Day, Sci-Fi, Spoof, The Original and tagged "Nobody Here but Us Monsters", AIP, alcoholic, boy who cried wolf, Drive-In, Edward L. Cahn, flying saucers, Frank Gorshin, James H. Nicholson, low-budget, rednecks, Samuel Z. Arkoff, teens. Yeah, I caught this on AMC’s old American Pop program going on 15 years ago and I was pleasantly surprised-not at all what I expected. I liked the sense of humor but, like you said, there are still some scare…I particularly dug the costumes. Of course one thing you might have missed-this was remade…for TV…in the 60s. Larry Buchanan was tapped to direct a bunch of extremely low budget remakes of AIP’s back catalog for TV, mainly because they wanted color movies. The results are terrible, all round. This one became Attack of the Eye Creatures, which is really only bare able as a MST3K episode…though I somehow saw it without MST3K first and boy, even as a kid I knew it stunk. MST3K or a good crew of friends who like bad movies (and a lot of beer) would be the only way I’d watch it again. It’s horrifically dull. Oddly enough (or not so), I prefer being dead sober so I don’t think it was my brain making stuff up when watching some bad films. I’ll get drunk later after I realize I wasted my time watching some of the worse films I’ve seen, ha!